So it is that time of the season and everything has been crazy busy. I haven’t had a chance to post any reports so here it is. Sun: fished 500 fathoms on south poormans canyon and were 1/4 on whites in first 2 hours but the severe thunderstorms pushed us out of the area and inside. The weather never let us back in where the fish were. Fished on Trade In for an overnighter Monday into Tuesday: overall we caught 3 makos, 1 40# yellowfin tuna, 20# bull dolphin, and a bunch of golden tilefish. Overnight bite was lacking and there were so many sharks out there. We caught a hammerhead and a tiger shark in the dark as well. The water was there on Monday but pushed out of there Tuesday. Today: I am heading out on the boss Lady towards the Elephant trunk as i type looking for tuna. Gonna get in a nap since I am mating today, kinda nice. Hopefully I will get today’s report posted up at the end of the day. I mated for Captain Joe Trainor today on the 55′ Gwaltney, Low Profile. Lots of thunderstorms moved through early, but were gone by the time we pulled out at 3 am. The ride down to 19 fathom lump was fairly nice but as the sun came up so did a stiff 15-20 know WSW wind. It got kind of nasty and stayed choppy throughout the day. 19 Fathom lump showed is no bait and ugly water at first light so we trolled over the lumps towards Massey’s Canyon and worked our way to Masseys. At 11:00 we finally got into a few fish and went 1/2 on small yellowfin and caught 3 decent dolphin. We had two more solid tuna bites but the fish completely missed the bait. That was it. Tough fishing. The water looked better and conditions were starting to look better with a few slicks and chick birds at Masseys when we left. Joe pushed the 12 hour trip a little longer trying to get one more round of bites but no luck. We had Todd’s group that fished with us on Boss Lady quite often to change his trip date to an overnighter last night, and WOW, did it pay off. The fishing was nothing short of EPIC! We left Avalon around noon and made our way to the NE Corner of the Washington Canyon where the tuna fishing has been hot for yellowfin tuna and BigEyes for well over a week. The weather could not have been more perfect and the 100 mile ride was flat as could be. We made it to our destination and got on the troll around 4:30. Bill was marking tunas under the pilot whales thick, but we could not get a bite on the troll at all, and it was getting frustrating. I dropped down a planer but that was unsuccessful as well. 30 minutes before dark we decided to stop and drop down some jigs on the tunas heads. BAM! Game on. We were hooked into a BigEye which Ben fought for an hour and 20 minutes while the rest of the guys were bailing yellowfin tuna on jigs. Ben beat the fish and it came up for an easy gaff shot. 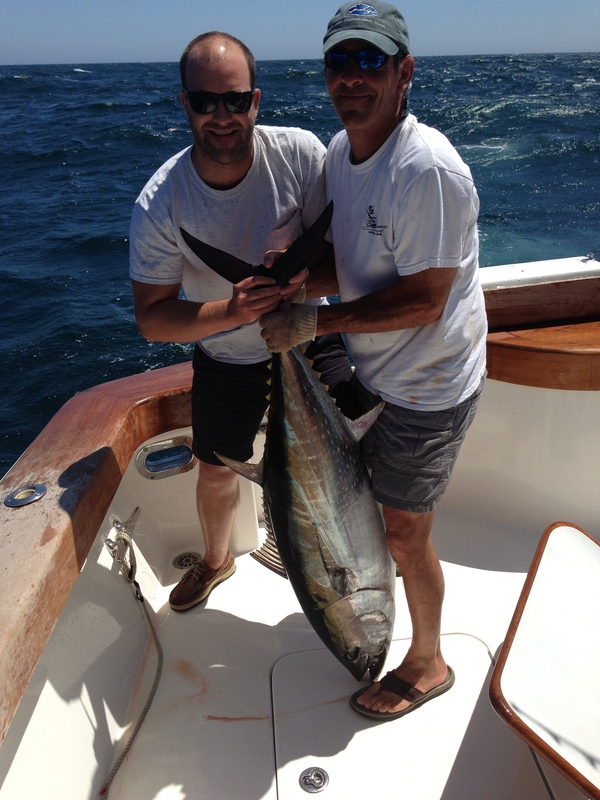 In the boat came the monster 200# BigEye which is Ben’s first tuna ever! The action was nonstop all night on jigs and freefloating chunks. Bob, Todd, Andy, Bill, and Ben jigged away all night whacking one yellowfin tuna after another. All of the yellowfin ranged from 15-40 lbs. After catching over 50 tuna, and obviously we had a limit of fish in the box, everyone started to wind down. Andy was still jigging so I wanted to join into the fun and went to the rail with my favorite spinning outfit for jigging. After 10 minutes of jigging, and watching Andy catch and release 3 yellowfin, I finally got my bite, BIGEYE on. The reel screamed off line! We woke up Bill May since we knew we were gonna have to chase this one. After an amazing team effort, and 1 hour and 45 minutes of pulling on this tuna, we landed another BigEye on a jig. Absolutely INCREDIBLE. Nonstop action all night with an awesome group of guys and flat calm seas. It doesn’t get any better. I captained the 54′ Ocean Yacht, Fin Addict, for the Viking Ocean Showdown that went on the past two days. We were allowed to leave the inlet at 4:30 and fishing time for the tournament was 8:30am-3:00pm. DAY 1 started off with a thick fog due to the upwelling we have had from the nonstop SW wind. The water temps on the beach are in the upper 50s and made for a nasty fog in the harbor up to 30 miles out. Fog is never fun to run in, but luckily everything went smooth. With the minimal reports of billfish, and the fact that the only decent water was way South, I pointed the bow for the deep between the South Poormans and the Washington Canyons. We were only able to make about 22 knots due to sea conditions so we started short of where I wanted to be. We started off in 75 degree BlueGreen water and picked up a dolphin right away. We made our way South and unfortunately up sea until we got into the general area I wanted to be in. All of the sudden we had a quad of sailfish come up. Both flat lines got whacked, Spencer was feeding one on the left long, then I had one on my right teaser that switched off to my bridge rod, and then another came up on my right teaser and never ate. 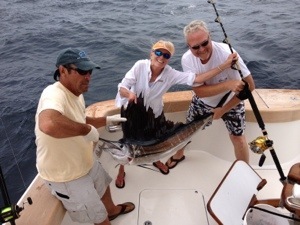 We had two on but only got the release on one which Coni brought to the boat. At this point I found 77.5 degree blended blue water. We pounded the area since there was nothing else going on anywhere else as far as billfish and had a teaser bite from a white marlin that never panned out. DAY 2 had the same start with the ridiculously thick fog, but we putted our way out the inlet and head for 600 fathoms in the Washington again. Today I ran about 25 minutes into fishing time until I got to the break which put me in 78.3 degree blended blue water. The day started off with a white marlin bite early. 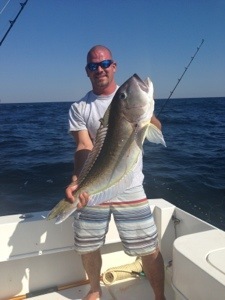 This white was all over the spread before it finally came tight on the left long naked ballyhoo. Coni brought that one to the boat and we were stoked considering fishing was tough and we needed every bite to connect for this tournament. We spent the ret of the day pounding it out in this area since we had some bait, but only managed to see one more white marlin that never ate. After two tough days of fishing, we managed to pull out 1st Place in the Viking Ocean Showdown. We won most points white marlin, most points overall, and Coni won top lady angler. Sunday I made my first trip out on the Fin Addict, a 54′ Ocean Yacht out of Cape May NJ. 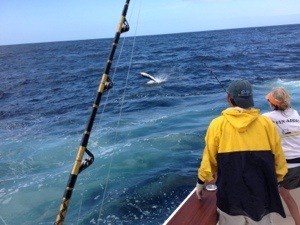 We were searching for some tuna, and with the solid reports of bluefin action, we decided to target them. Our ride to the Hot Dog turned out to be rougher than expected with the super tight chop so we got there much later than planned, and missed the first light bite, although it sounded like there wasn’t much of one. We had lines in at 6:45 pm and pounded out the NE Corner of the Hot Dog all morning with no success. We marked tons of bait, mostly sand eels on the edge of the Dog in 118-132 feet of water just about every pass, and I did mark an occassional tuna, but nothing like what I heard others were seeing previous days. We did manage to troll up on dolphin. With the slow bite and my lack in confidence we would get any kind of afternoon bite here, we picked up and ran into Massey’s around noon where I heard a friend of mine had a few fish. At this point it was blowing every bit of a stiff 20 knots and we had 4-5 foot seas at a choppy 4 seconds. Up sea trolling was not a great option so we worked down sea towards the 19 Lump. Finally, the fish gods graced us with our tuna bite on the left wayyy back rigger at 1:15 and Richard put in work on a nice 100 pound bluefin tuna. After about 15 minutes Spencer wired the fish to the gaff and in the boat came our tuna. Needless to say, we were all ecstatic considering how slow it was all day. We threw the lines back in and decided to give it a little longer to see if we could catch Ryan his first big tuna, and sure enough, down went the left short rigger and we lucked out again on a carbon copy bluefin. After about a 20 minute battle Spencer wired and released the tuna and we headed for home. The hail mary at the end brightened everything up and made for a fun trip with a bunch of great people.